Driving time will be approx. 30 min. and approx 30 km in distance. Exit the Airport and make a LEFT turn onto the main street, which is known as Roosevelt Weg. You will remain on this road for approx. 15 minutes and will pass the Hato caves on your right hand side, a KFC on your left hand side and a farther distance away a NAPA autoparts on your left as well. Once you have reached the end of this street there will be a round-about which will be located at the second traffic light you encountered. At the round-about follow the signs to direction Willemstad which will be the second "exit". 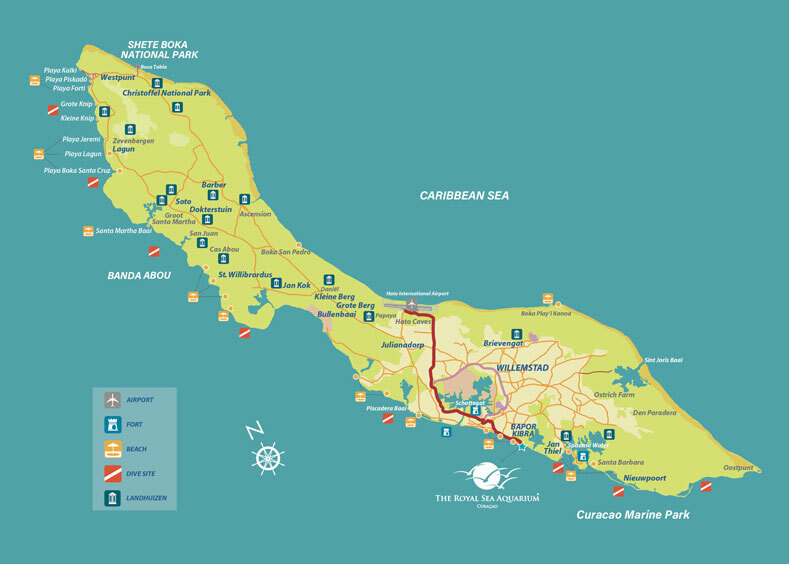 This will place you on the main road in Curacao which goes around Willemstad called the Schottegatweg, a.k.a. The Ring Road. This will take you past the refinery and harbor on your left hand side and bring you to the main very large bridge in Curacao. Continue down this road. The duration will be approx. 10 minutes. Once over the bridge, which separates Punda and Otrobanda you will continue down that highway, passing Infotrans on your left hand side, the US consulate on your right hand side, and a green apt building on your left hand side. At the third traffic light which is located in Salina where the McDonalds, KFC are you will make a right hand turn. This will bring you to the Salina Ring which is another round-about. BEWARE though that you do NOT have right of way in this roundabout and it is not like roundabouts in England! At the Round-about you will follow the sign that says direction The Seaquarium. Once on Caracasbaai you will take the first traffic light and take a right which brings you to Dr. P. Mahlweg Street. Here you will take the street down until the end and by the ocean take a left turn to Martin Luther King Blvd. There you must take the street all the way to the end, passing Princess Casino and shortly after that arriving to a large parking area. Go towards the sign in the far end of the parking lot that says "Welcome to the Seaquarium" and there will be a security gate with security personnel. Tell the security guards that you are checking into The Royal Sea Aquarium Resort and they will let you pass to unload your luggage. Voila! You have reached The Royal Sea Aquarium Resort!